When was the last time you bought something online? Did you think about the price you paid, and wonder if you could have gotten a better deal? I’ve always thought about that, but usually I come to the conclusion that I just needed to do more comparison shopping if I really wanted a better price. In the physical world, it’s quite rate for a single product at a single store to have two different prices at the exact same time. Yet, on the Internet this occurs a lot more frequently than you think, where one person may be charged a higher price than another depending on their characteristics. Who will a self driving car kill first? In developing self-driving cars ability to react to crashes, there are many moral dilemmas we will run into in the process. Should the car drive into a wall to avoid hitting people, but hurting the driver in the process? Or should it drive thru an intersection, hurting those in the crosswalk but sparing the driver? There are many moral dilemmas like this, all a variation of the classic trolley problem. MIT has developed a platform which allows anyone to judge different scenarios a self-driving car could face (theoretically) and pick the “lesser of two evils”. The website also has the option to create your own scenario. I judged a few scenarios and then took a look to see how my results compared with others, and was surprised at all the biases the survey made apparent/accounted for. NOTE: The following is a blog post written for a class I’m taking this semester, “Legal & Ethical Issues in Information Technology”. Between now and the end of April, I will be syndicating content I post on the class blog, so most of the writing I do in this period will be about technology ethics and law. Enjoy! Is social media addictive, and what role should the companies behind social media products play to ensure their products do not directly lead to an addiction to the product? What about any company with an addictive product? Been a while since I posted anything here, so I figure I’d give another status update and think out loud (feel free to email me with advice too). It’s now been one year since I started full time at Packback, and two and a half years since I joined the company as an intern. Lately, I’ve been kept busy with all the awesome things we’re working on, helping to make sure the upcoming Spring 2017 semester on Packback Questions will be great, and even better than the success we’ve had this past semester. Lots of exciting challenges have come up with team members coming and going, new processes, implementing big features, and more. It’s been taking up around 75% of my time, and I love it. Will be staying here after I graduate so I can get the full startup growth story, and be a part of it. I could go on and on, but maybe you should just come check us out. Studying Computer Science - UIC or IIT? The following is an excerpt from a conversation I had with a junior in high school, looking for advice on studying Computer Science at a Chicago university. I thought it would be useful for other students to see, especially as the deadline for choosing colleges is May 1st. Obligatory disclaimer: I do not speak on behalf of any of these schools. My opinions only. I see that you’re attending IIT. I’m currently deciding whether to go to UIC, IIT, or DePaul for undergraduate for Computer Science. Right now, my current plan is to go UIC. IIT is a little bit more expensive. What would you recommend? What projects is Eric working on, and what is the status of each? Find out here. Will list in order of importance. Takes up about 75% of my time most days. Enjoying my time here, feeling more and more like a real software engineer every day. Being the only one working on the backend full-time, I get the chance to make a lot of architectural decisions - with much feedback of course. We’re hiring someone senior to help distribute the workload and also teach the rest of the team lots of new things, so check out working for Packback. Eric: I am pretty sure the world is going insane. Who is the crazy one? Krisztián: The world’s always been insane. Life could be as simple as just getting food, water, and shelter, but we humans choose to make it harder for ourselves. Recent events have made me consider the fate of humanity even more than I have in the past. I am not confident we are moving in the right direction as a whole, and the Internet amplifies reasons for concern. After having this exchange with a good friend, it made me think yet again about the effects of technology and our modern society. As a full-stack engineer, I use a lot of different technologies, from the highest level to the lowest level. Lenovo ThinkPad T430 - My workhorse computer. Gets the job done. Somewhat heavy, worn-down battery life around 4hrs. Computer of choice for any code I’m writing. Dual-booting Ubuntu 15.10 and Windows 8.1, both on an SSD. Samsung Galaxy S4 - I bring this wherever I go. Has got free 4G LTE service (thanks Freedompop) and enough space to store a couple dozen apps, no music. Has a pretty good camera too. Custom Android ROM. iPad Mini (1st gen) - For watching videos or doing other tasks that need a screen larger than a phone. Pretty slow, can only have 2-3 apps open max. The world is a very tumultuous place right now. Violence is rampant, intolerance is becoming more widespread, and emotions are winning over the voice of reason. Rhetoric is flooding the airwaves and social media. It’s all very chaotic. How do you escape it? Take a break. Stop trying to drink from the firehose of Twitter. Forget Facebook for a bit. Turn off the TV and talk radio. There’s a lot of negativity right now. We’re not designed to cope with this much. So step away; disconnect. The negativity will dissipate. Be calm. Enjoy simple pleasures. Write to yourself if you need to get something off your chest. Let the chaos flow out, onto the page. When you are finished, tranquility will have arrived. It has for me. This is my pause. Happy Halloween! The following was originally posted on Facebook. 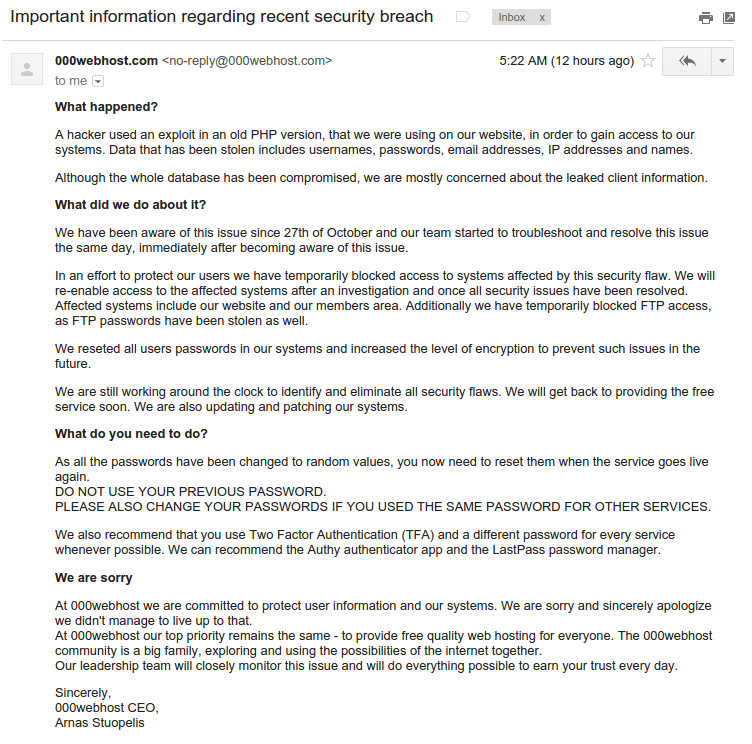 Got this email from 000webhost this morning. Apparently they just found out they got hacked, and everything was taken. This is my first time hearing about the breach. It’s horrifying that people still store passwords in plain text at this scale. Even more horrifying that the hack was done in March and it took this long for 000webhost to become aware of it.